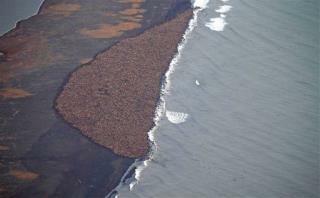 (Newser) – Aircraft, media, and curious folks in general have been instructed to stay far away from the 35,000 walruses crammed onto an Alaskan beach to prevent the easily spooked animals from stampeding each other to death, the Guardian reports. "When they lose their sea ice habitat and come ashore ... they gather in large numbers, and it becomes like a giant pig pile," a managing director for the World Wildlife Fund says. "When they are disturbed, it can cause stampedes in large numbers."